Given a chance to share your passion and love of what you do has never been easy in today’s life, people are busy and time is never on anyone’s hands. 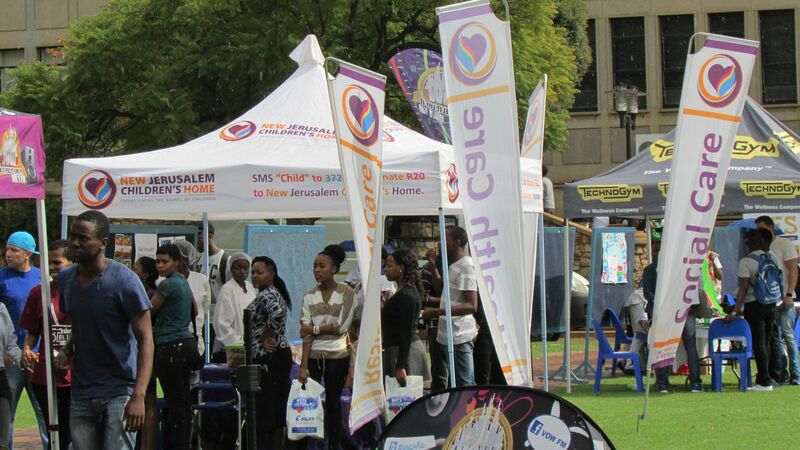 On the 26 April New Jerusalem Children’s home was given an opportunity to share its works and to voice for the children to students of University of the Witwatersrand ‘Wits’ sharing the library lawn with many other great NGO’s doing different social development work in the country, an event organised by the university for organisations such as ourselves to share and to lobby for support from the many academies of the institution and promote our works to them. New Jerusalem Children’s Home went to the university with the bakery products to sell and to share how the bakery profits are directly benefiting lives of the 88 children currently under our roof who were take care of, inviting Wits public to join the organisation’s I-volunteer program and further igniting thought of bettering lives of children of the organisation through their Wits attained education in the future. Being presented with an opportunity of talking to over 600 students on the day much hope was given by the students, from registering to be a volunteer of the home to sharing solutions on how to lobby more students and to also increase the organisation’s visibility on campus through the many students outreach programs. “This event has been happening for the past two years since I have been here and today I am doing my third year, how come I have never seen you coming to talk to us about this good works you are doing, asked one of the students visiting New Jerusalem Children’s Home tent, added by saying – my parents are staying in Midrand which is closer to you and they have been involved in this kind of works, they have been saying why isn’t there an organisation closer to us which we can drive less kilometres to get to, yet you are there”. Jumping to her phone and taking pictures, this assured us of a new family coming to help us. From the Wits event, New Jerusalem Children’s Home recorded a total of R450.00 total sales in a space of less than three hours, stock out on the Oats-biscuits and an after event scones and biscuits order valued at R1650. New Jerusalem Children’s Home wishes to do certain things for its children through the bakery and focusing your donations on a more intense child’s needs, with you supporting the bakery and inviting us to promote our products in your NGO related events we will put our bakery in a more self-sustainable level and well-enabled to be a skills transferring centre to children. More orders from you will mean a more sustainable project for the bakers and more time to show our children how to bake, package and distribute good quality products back to you. This will ensure that when children from this organisation, New Jerusalem Children’s Home, leave us to be independent in the society, they will be marketable and skilled in the bakery industry.